National Convention XII: Brotherly Love Since ’94 — Iota Nu Delta Fraternity, Inc. This summer, our brotherhood gathered together in Philadelphia, Pennsylvania, the “City of Brotherly Love”, for an unforgettable weekend full of laughter, bonding, and personal and professional empowerment. INΔ National Convention is meant to serve as an opportunity to help equip our undergraduate charters with the learning and resources they need to make a greater impact on their campuses and in their communities. This year, our convention committee managed to record the largest number of member registrants from our ever-growing organization. Our key goal for Convention XII was not only to emphasize with our undergraduate leadership the fundamentals of running a charter, but to work with them in using those fundamentals in developing a vision for their chapters. With the establishment of new colonies, the historic attainment of chapter status by three of our schools, and the continued growth of our brotherhood, National Convention XII provided the platform necessary to chart the course of the next chapter of our brotherhood. Friday morning began with Brothers venturing to North Philadelphia, where at Temple University, leadership meetings were held to assess communications, charter management, and community impact. Through group and individual meetings with charters, National Board, gained valuable insight on avenues to better provide support and resources for the undergraduate membership. Leadership discussions culminated in a catered lunch, graciously provided for by Flambo Caribbean Restaurant. Special shoutout to brother Kevin Ramlochan and his dad for making this possible. After rounds of grueling competition and heartbreaking upsets, a victor emerged... Congratulations to Iota Nu Delta Fraternity, Inc. - Binghamton University for winning first place and taking home the Body Award. On Friday evening, we held our Alumni Reception. Before the night was underway, Brothers heard from an alumnus of our Alpha Chapter, Jamil Ahmed, who spoke about his current experience battling cancer and initiatives that he was working on support others dealing with disease. The Alumni of the Year Award was also presented to begin the night, and it was awarded to Nipun Patel, INΔ Philadelphia Alumnus and the first brother to be elected to partner at an AmLaw 100 Firm. Through a moderated career panel, our alumni discussed their experience within their respective fields and important lessons they had learned over the course of their careers. Following the panel, the event became more social via a cocktail hour, where our undergraduate membership was given an opportunity to eat, drink, mingle, and network with alumni. 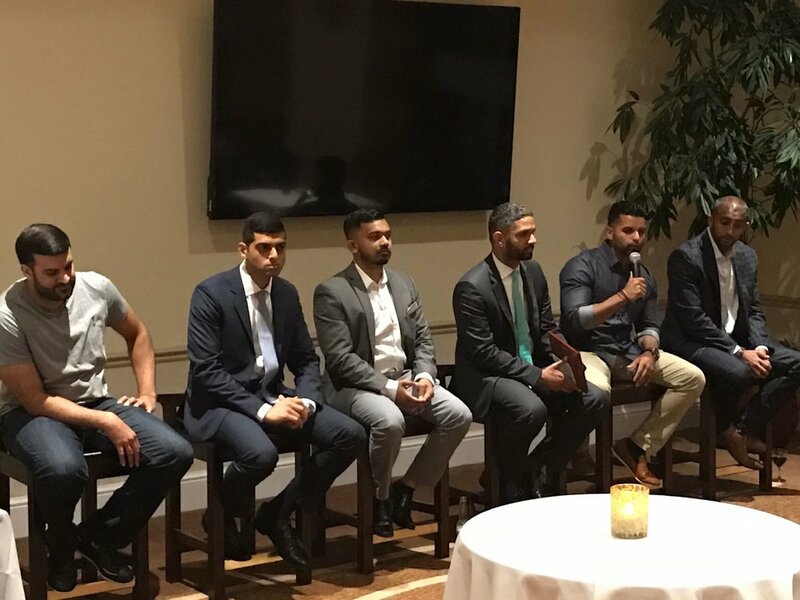 Throughout the event, Brothers had an opportunity to build on their professional networks, build personal bonds with Brothers of different generations, and see the impact INΔ has in promoting career success. After a night out in Center City Philadelphia, Brothers met Saturday morning at Drexel University, to better understand and to develop strategies regarding a variety of important aspects of fraternal life, including recruitment, intake, academics, budgeting, alumni relations, and brand identity. National Board also had the opportunity to showcase their vision for the upcoming term and address questions from the membership. A long day of meetings was capped by presentations by three of our schools seeking to attain chapter status.